Hope everyone is having a good week. It has been a busy one for me but everything is great. 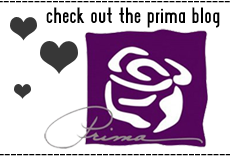 Prima has started launching their sneaks peeks everyday and I must say-you are going to love it! I really think there is something for everyone-every style, every taste and more flowers than you ever realized you needed. And if this means you need to get your stash used up before you get more-then do it! I use a whole package on every page, but that's how i roll...:) It definitely helps you use up your supplies to make room for new. So I wanted to share a couple of my new layouts using the new stuff. 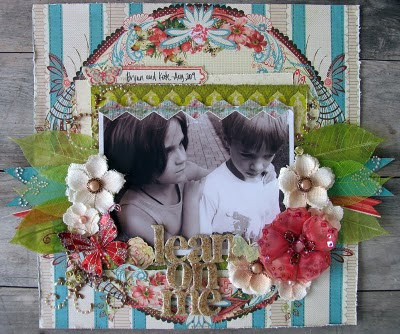 This layout was made using the Strawberry Kisses paper line. I am in love with the color combination and the designs are so vinatge. 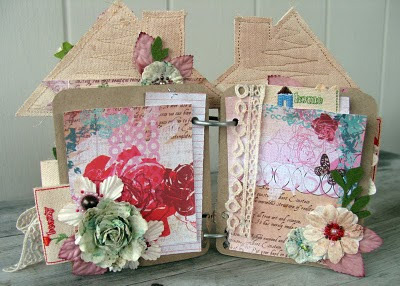 I used some new pearl swirls with the roses, butterflies, burlap flowers and more....like I said---the whole stinkin package!! 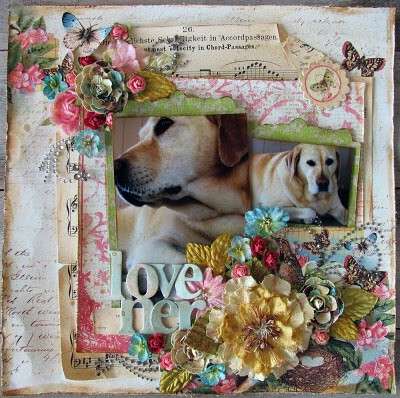 Here is the second one using the new Shabby Chic paper lines and an array of flower goodness. Cass was a great sport-she let me take as many pics as I needed (unlike the boys who have become extremely impatient in that area). So that's all I can share for now but it's a nice start! There will be lots more soon!! 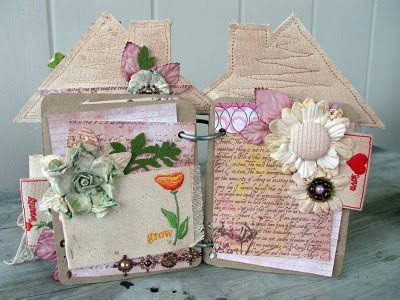 Oh and by the way-head on over to the Prima blog-they are having a flower giveaway -all you have to do is comment on it and you could be chosen! Go here and you have until Friday!!!! But I plan to go down again soon. I had cookie exchange and party with great friends, my FIL came to visit which was so nice and then Matt came home for Christmas. We did a secret santa exchange and breakfast at work-loved it! The kids had a great time-they loved their gifts and they loved having family here too. We managed to do Christmas without using a single credit card!! That is a major accomplishment and no surprise bills in January. Plus-I don't want to give any more of my money to those greedy credit companies. There are seriously robbing people with outrageous finance charges and putting everyone in horrible positions. It's snowing here like crazy... I love these days when I have no where to go and I can stay in sweats all day. 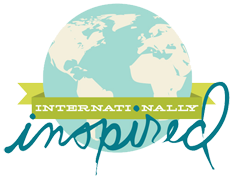 And of course update my blog a little bit. I have a couple of projects to share. 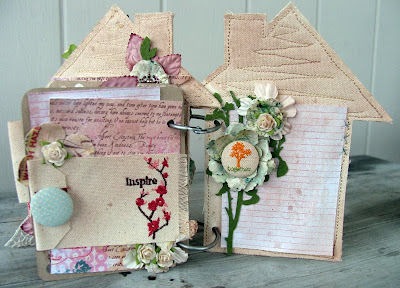 And this little house book came together like nothing else I've made. I knew what I wanted to do in my head but I never expected it to come together so nicely. 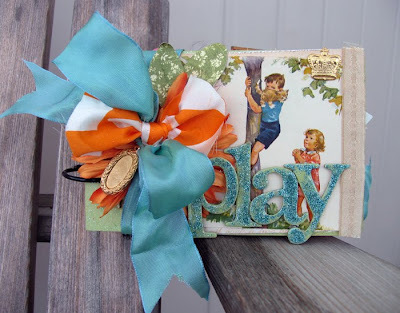 Prima featured it on their blog and then Donna Downey decided to feature it too....very cool! I appreciate that so much! And of course I had to post it on my own blog as well. I used two canvas houses for the covers. They come already stitched and ready to use for whatever you like. 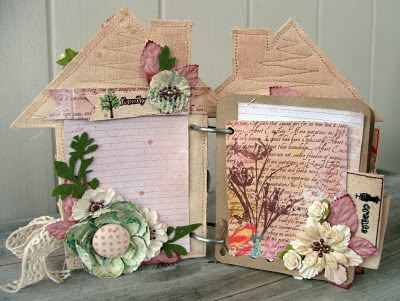 I made the pages inside from Prima packaging (remember the kraft packaging?) 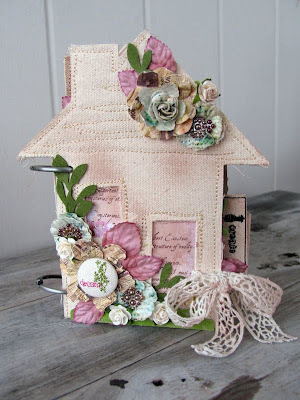 I decorated it with canvas tabs, tags and buttons, Prima roses, paper leaves, pearl centers, lace and more! 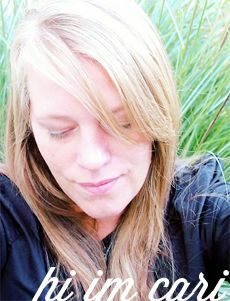 Oh and i also sprayed it with Walnut Gold glimmer mist to give it an aged look--love that stuff! I can't share until they give me the OK, but I promise to post layouts and projects I've made using all of the new goodies when they give me the green light!!! Thats all for today! Enjoy your Sunday, relax, create and leave the house work for tomorrow..